55.5 x 28" and 53.5 x 33"
Handwoven silk and cotton thread, dye, PVA, canvas backing. Andrea Donnelly, History Of A People #1 and #2, 2017. History Of A People #2 - detail. 84" x 124" x 5"
Linen, cotton, and copper thread, dye, oak frames. 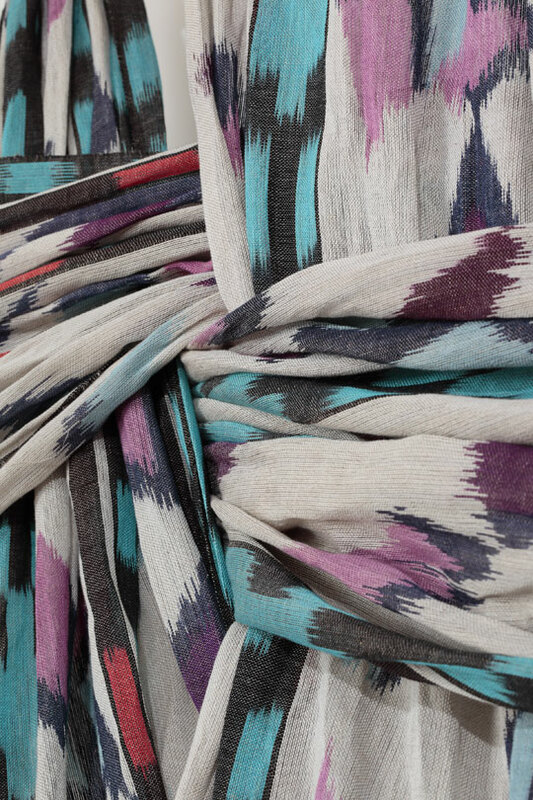 Painted warp and ikat dyed. 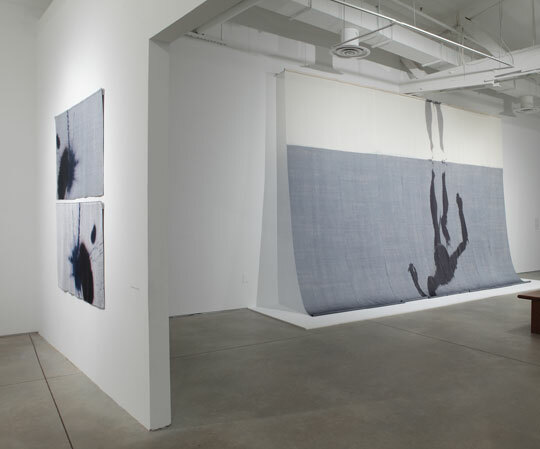 60 continuous feet of painted, dyed, and handwoven cloth. Part of the Crown Jewel Project. "Cloth is a language, complex and multi-faceted, which I use as a critical lens to understand and interpret the world around me. I work specifically with cloth I weave by hand. Having chosen to work in this craft-based and still marginalized medium, the decision I made five years ago to expand my studio practice beyond conceptual artwork and into functional textiles was not taken lightly, and the experience has been rich, complex, and enlightening. My skills as a weaver and my critical perspective as an institutionally trained fine artist have together given me a unique position to create textiles that inspire comfort, connection, and a deeper sense of the importance of the choices we make regarding the objects we bring into our lives and spaces. From this position, making and consuming becomes a moral and political act, a statement of values." "The artworks in the Crown Jewel Series are a reflection of my experience, from within the privacy of my studio and out into the public domain, of opening up my artistic practice and creative energy to functional work. 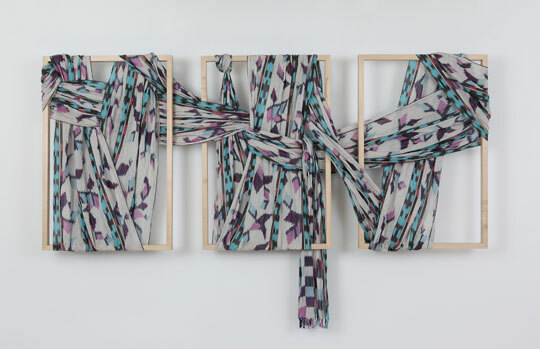 Through the form of the humble scarf I examine the larger questions at work in the tensions of my practice: the potential and handicap of craft, the value of labor, the arbitrary values of objects based on classification of art or not art, the commodity of time. In blurring and confusing those sliding-scale distinctions that work to assign value and position to people and objects, I hope to create space for reconsideration of these systems. The Crown Jewel Series is generously supported by a Windgate Fellowship Project Grant from the Center for Craft, Creativity, and Design." Handwoven in ten panels. Dyed warp and weft, painting. 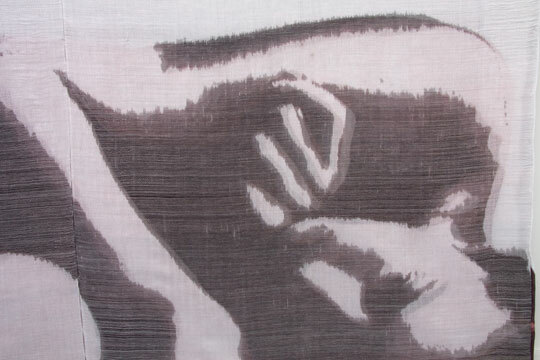 Image was painted onto woven cloth. Cloth was unwoven and rewoven so image (warp-faced on bottom half, weft-faced on top half) mirrors itself. Cotton, fiber-reactive dye, textile pigment. Handwoven in three panels. Painted warp. Image was painted onto unwoven warp threads then woven into cloth. Panels stitched together. Andrea Donnelly, The Veiling #1 (from The Veiling Series), 2012. The Veiling #1 (from The Veiling Series) - installation view. Handwoven in four panels. Dyed weft, painting. Image was painted onto woven cloth. 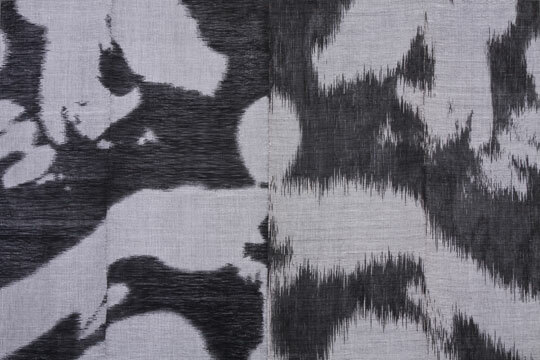 Cloth was unwoven and rewoven so image (warp-faced on left side, weft-faced on right side) mirrors itself. Handweaving, dyed weft, painting. Image was painted onto woven cloth. 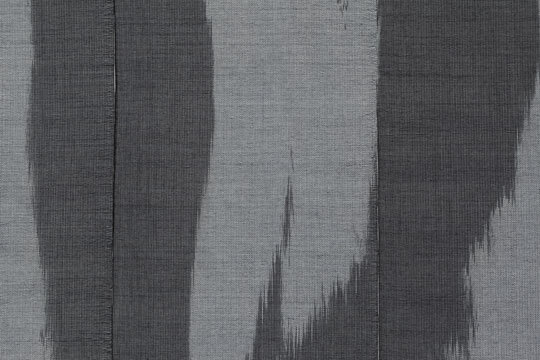 Cloth was unwoven and rewoven so image (warp-faced on left side, weft-faced on right side) mirrors itself. 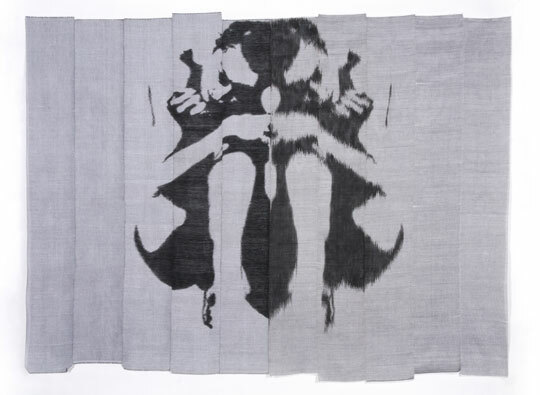 Andrea Donnelly, Body Blot #3, 2012. 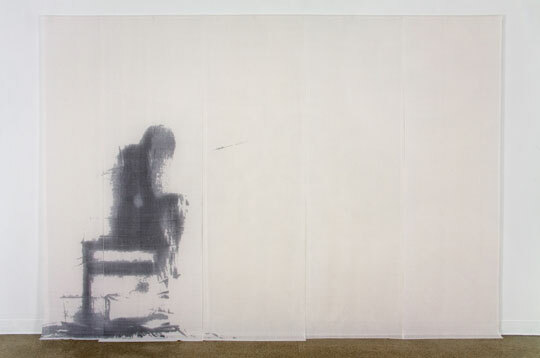 Andrea Donnelly, Body Blot #1, 2011. Body Blot #1 - detail. Handwoven in five panels. Painting. Image was painted onto unwoven warp threads then woven into cloth. Andrea Donnelly, The Weaver's Bench, 2010. The Weaver's Bench - detail. Cotton, fiber-reactive dye, textile pigment, quilter's flannel. Handwoven in three panels. Dyed weft, painting, quilting. Image was painted onto back panel of quilter's flannel. Image was painted again onto unwoven warp threads on the loom and woven into cloth. Woven panels were stitched together and placed over quilter's flannel. Flannel and handwoven cloth were quilted together in the area around the figure. 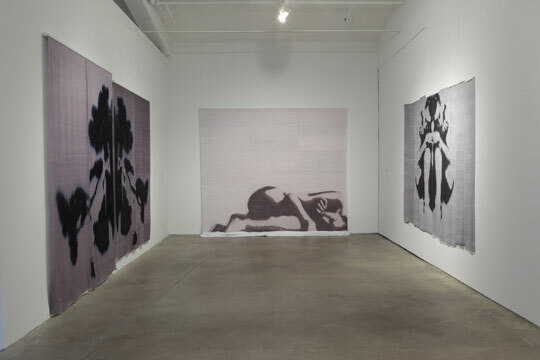 Body Blot #3, Comfort, Body Blot #1 - installation view. Also see the film, ANDREA DONNELLY: Where We Meet (below), which accompanied her exhibition of the same title at the Visual Arts Center of Richmond, September 7 - October 21, 2012. 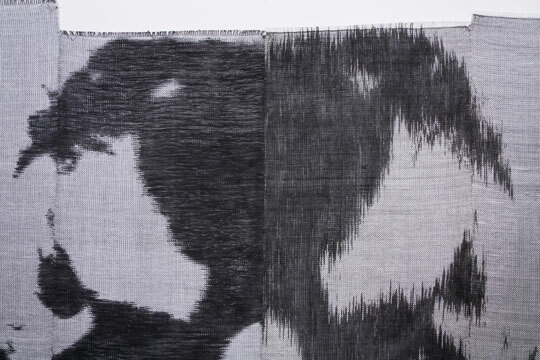 Andrea says of her work, "Cloth, in its seemingly infinite varieties of texture, weight, appearance, and significance, is deeply linked to our histories and emotions through the corporeal body. A simple touch can trigger vivid memories and powerful associations; some unique to a single life, some shared across an entire culture. I make cloth that pulls at these connections, investigating relationships between our physical bodies and our mental spaces through the act of weaving cloth by hand. 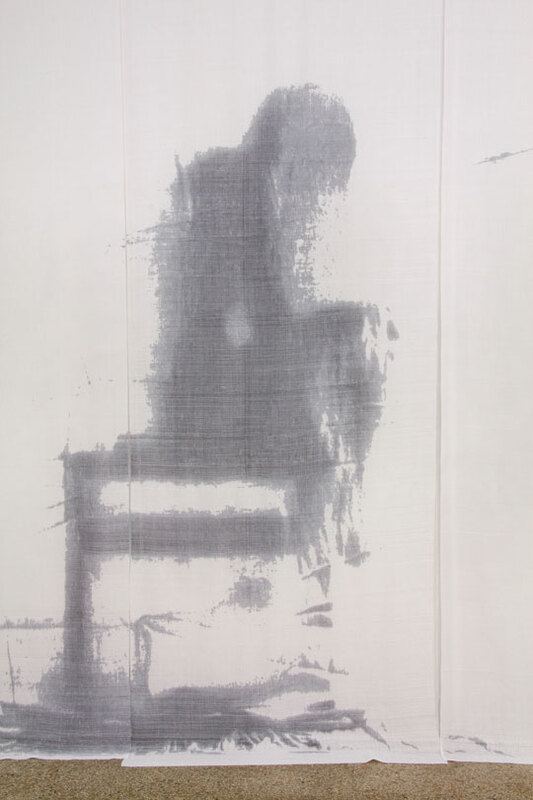 Emotional states and psychological landscapes become both tangible and tactile as I imbed handwoven cloth with whispers of a figure, with the language of the body. This exploration starts with photography, and my own body. Alone with a camera, I take hundreds of pictures. I hope to capture subconscious gesture; a fleeting stillness between breaths where deep emotion reveals itself, momentarily unguarded. 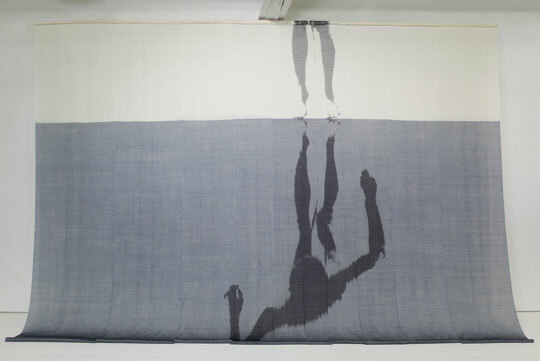 What I capture, I paint onto unwoven thread, and through weaving submerge this shadow of my form within an ethereal and delicate landscape of cloth. In these quiet structures, the monumental quality of scale suggests a mental rather than physical space." 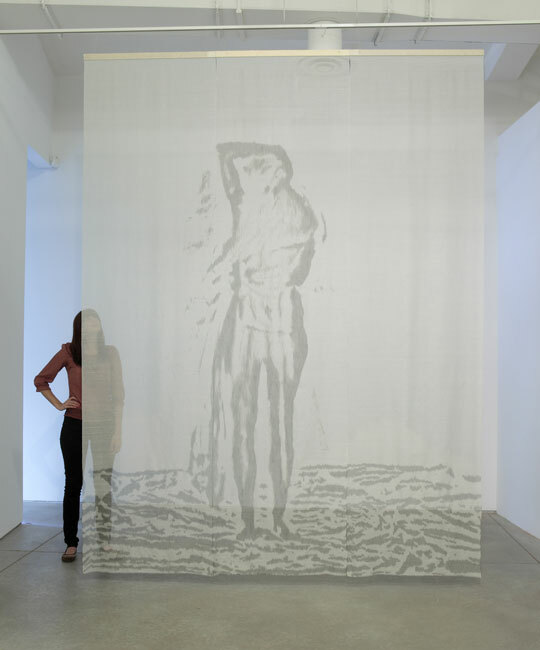 "My handwoven cloths are substrates for the figures painted within them; they are also physical and metaphorical records of my body. 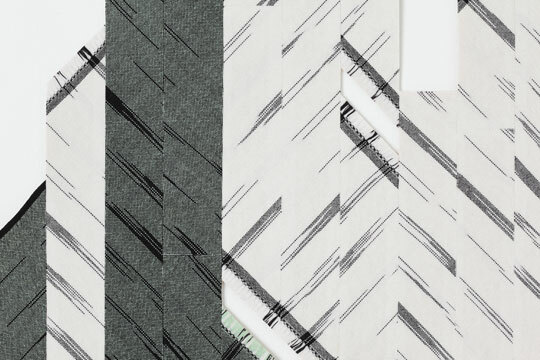 As weft meets warp on the loom, building slowly thread upon thread, an image materializes within its woven environment. This is a solitary, meditative act. 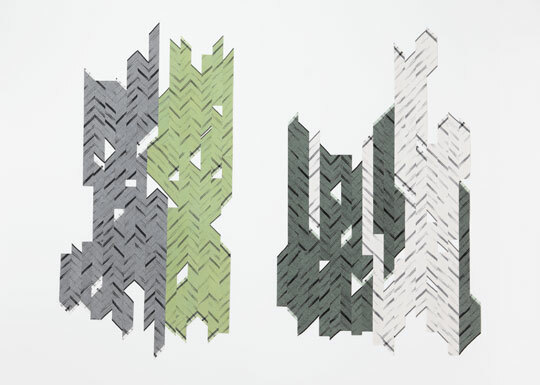 These making processes are vital to the finished piece: they infuse a sense of time's passage, of quiet depths, and even the evidence of some unnamed private neurosis within the subtle irregularities of each handwoven structure." 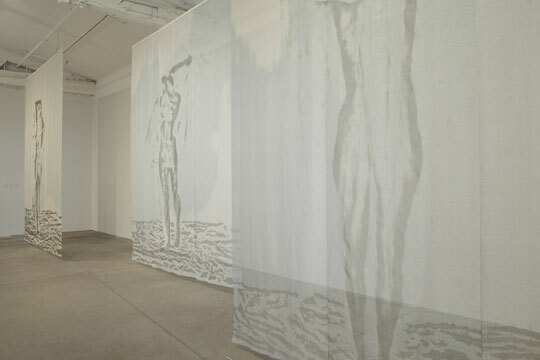 "In many of my works the body is painted onto woven cloth, the cloth is unwoven, and then two new cloths (or one cloth twice the size) are woven from the original warp and weft, creating two distinct and subtly different images of the figure from one. 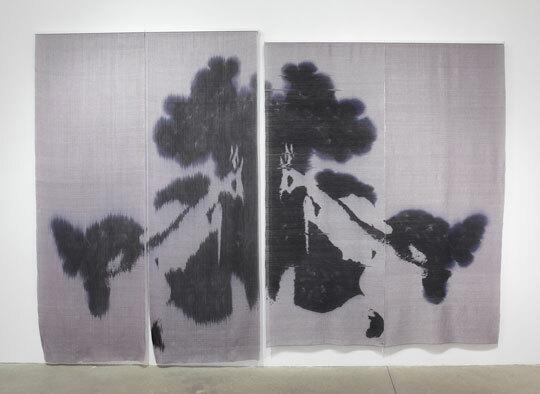 This process evolved from my fascination with psychology and the symbol of the inkblot, which, like cloth itself, can represent a unique individual experience as well as a collective understanding. Alone or in reflective pairs, my figures are stains within cloth, the faint remainders of a private life. They are my connecting threads, binding personal experience with the shared experience of being human."